You have begun a romantic relationship with Theron. With the return of your former romance, you and Theron have decided to end your relationship. After losing faith in the cause and becoming disillusioned, Theron Shan has betrayed you and formed a plan to destroy your Alliance. Despite this, you've sent a message offering him a place by your side. 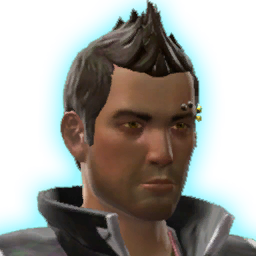 After losing faith in the cause and becoming disillusioned, Theron Shan has betrayed you and formed a plan to destroy your Alliance. Branding him a traitor, you issued a bounty on Theron's head. Theron's betrayal was too great, no matter his reasons. You left him for dead on Nathema with the rest of the Order of Zildrog. Theron has returned from being a double agent among the Order of Zildrog, and though you brought him back to the Alliance base to heal his wounds, his betrayal was too great to ignore. You have forced him out of the Alliance. After recovering from his wounds during the fight with the Order of Zildrog, you have accepted Theron Shan back, forgiving his apparent betrayal for the ruse it always was. After all of your adventures, after the rise and fall of the Eternal Empire and the Alliance, after his seeming betrayal and triumphant return, you asked Theron Shan to marry you, and he accepted.